A police car has collided with another vehicle and hit a garden wall while responding to an emergency call. 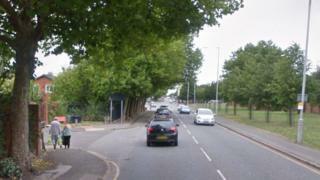 A PC suffered minor injuries when his car and a red Dacia Sandero crashed on Exmouth Close, Birkenhead at about 20:00 BST on Tuesday. Both he and the driver of the other car were taken to hospital as a precaution, Merseyside Police said. Appealing for witnesses, a force spokesman said an investigation into the crash had begun.